If I’ve said it once, I’ve said it a thousand times: I love Mugler perfumes. Alien is my signature scent. 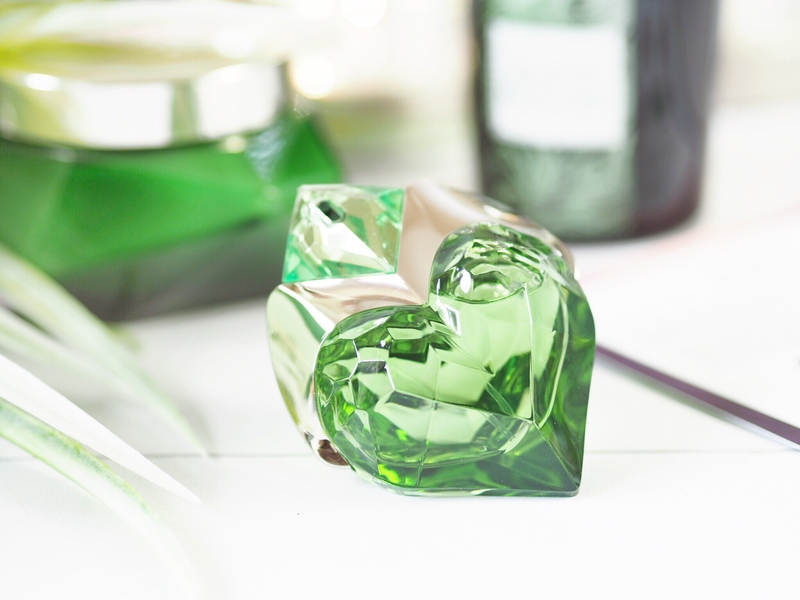 I am never without it on my dressing table, and even have a travel sized bottle in my handbag at all times. It’s been my go-to for years and likely always will be. But that doesn’t mean I don’t try other scents from the brand. In fact, not long ago I tried Aura and loved it as much as it’s sister, Alien. With the same heavy musk scent levels, just with a more herbal and botanical edge to the fragrance, Aura eau de toilette bares a lot of family resemblance. The thing I’ve always loved about Alien is how feminine and musky it is because I like heavy perfumes that stick to the skin and just provide this level of scent that you can’t find in other types of perfumes. 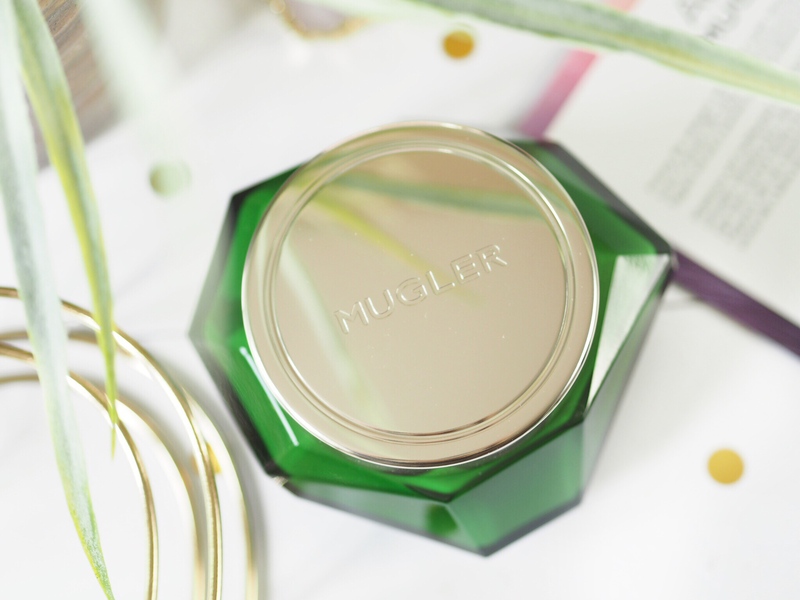 Mugler scents absolutely define musky and feminine for me – they exude sophistication and dare I say it, sexiness. You can’t beat their fragrances and there’s quite honestly nothing else like it in the fragrance stakes for me. So I loved trying out Aura and finding that it was equally as sensual. With accents of white vanilla, it’s got that perfect sweet edge to the scent which makes it ideal for girly girls, and the musk just means it’s also perfect for those who wish to be different in their perfume choice. It’s also got notes of pear, hibiscus seeds and iris root – so it’s also got these delicate edges of sweet and fruity elements too. It’s one of a kind – and I love it. My favourite of the collection is by far the candle: because I’m a total scented candle addict. I appreciate a good scented candle as much as a good perfume, so this went down an absolute treat. 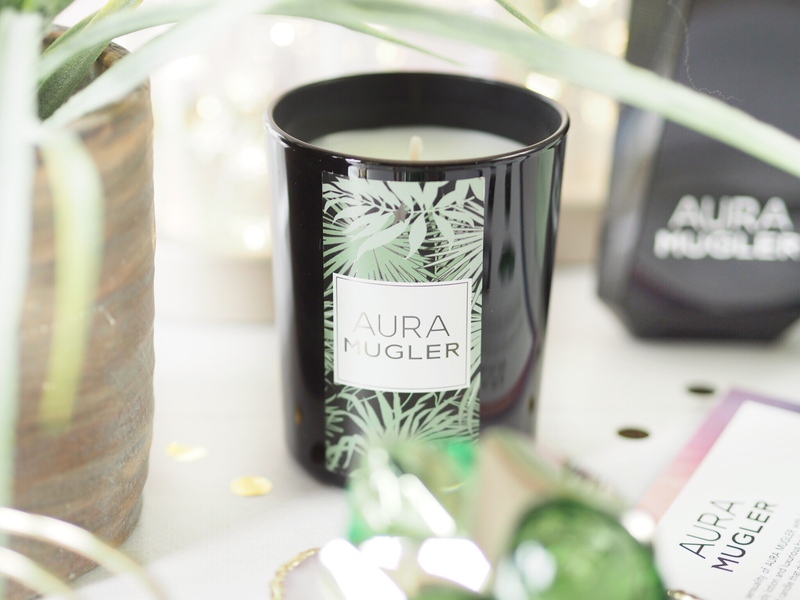 Bearing the same gorgeous botanical scent, Aura lends itself perfectly to a candle fragrance. Once lit the scent fills the house nicely and it’s actually different in the air to on your skin as a perfume – but just as impressive. It’s not too heavy or musky, as that can sometimes be overbearing in candles, but just sweet and delicate, while powerful at the same time. 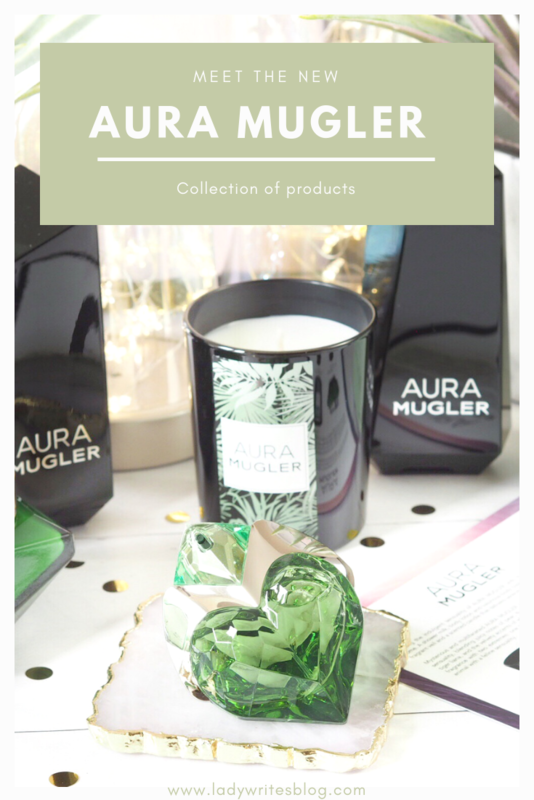 I’m a huge lover of scented candles to match my perfume so the Mugler Aura Candle is a huge hit with me. There’s also now a rich and creamy Body Cream to match the scent, which is perfect for when you want to extend the life of the fragrance on your skin. The Body Cream is deeply scented and luxurious, it’s a real ‘treat-me’ feeling when you’re wearing it and so indulgent. Plus the design is so fancy that you feel exclusive just having it. I find using this makes the Aura fragrance last so much longer because my whole body then smells like it! 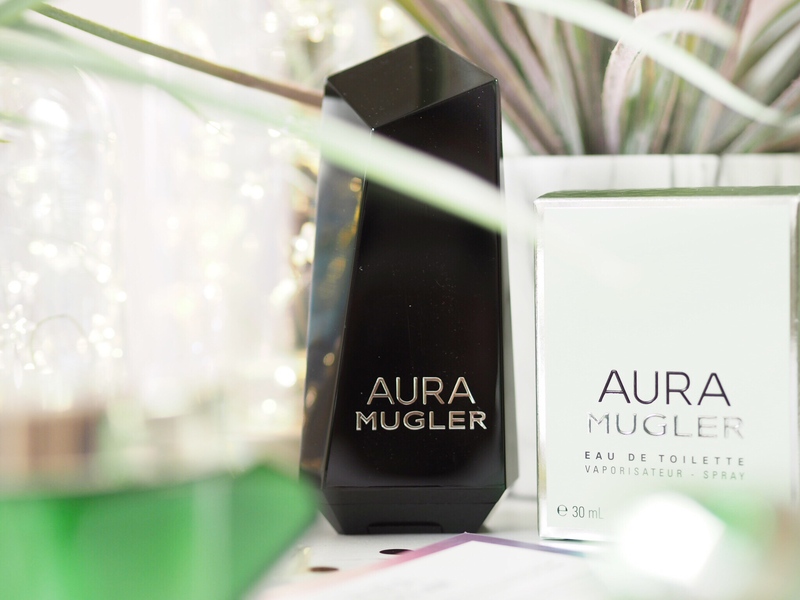 There’s also a lovely Body Lotion you can try in the Aura fragrance now too. Not to be confused with the Body Cream (above) because creams are thicker and denser than lotions, this is great for a quick, post-shower all-over. It will also lengthen the amount of time your perfume will stick to the skin and create a nice moisture level on the skin too. Another great addition to an Aura collection. Now this sort of product is one I always try and snap up when I get perfume because I just love scented shower products to match my perfume. To me it just makes sense to wash yourself in the same fragrance you’ll be wearing all day. A much deeper scent level will occur that way too. This one is a Shower Milk formula, so less of a bubble consistency and more of a rich texture that means you can also use it in the bath and it works so nicely there too. 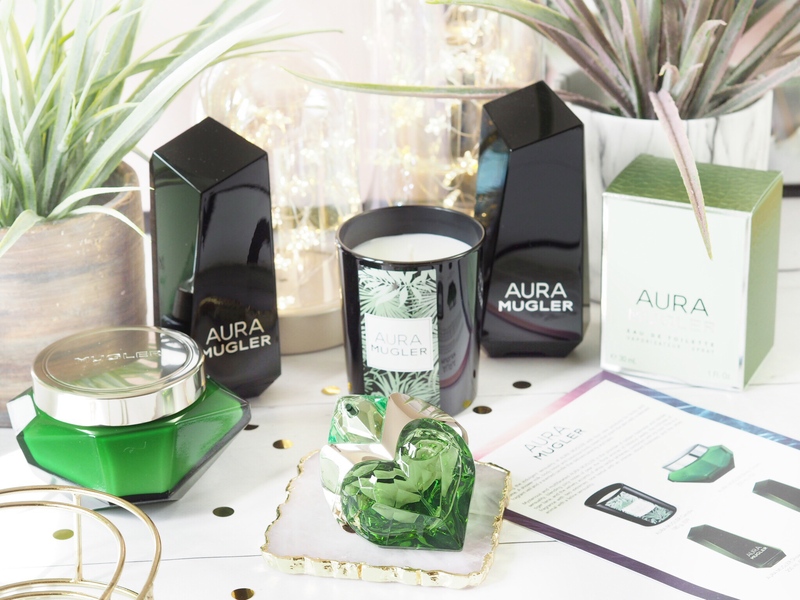 So if you love the Mugler scents and fancy the Aura fragrances as an addition to your collection, then pick up some of it’s entourage products too. Because no perfume collection is complete without matching products after all. Ooooo it looks SO nice, so so stunning! The bottle is incredible! omg this sounds amazing! The packaging alone is soooooo beautiful! I think the candle has my heart, the scent sounds lovely and I really do adore a candle you can use afterwards to hold makeup brushes! This sounds absolutely amazing! I know a lot of people love Alien! well this sounds amazing doesnt it!? i love alien! I am obsessed with Alien! I need to try this! I love the packaging. Oh my gosh, the packaging!!! And I love the candle! i adore Angel and Alien so I need to smell this! the bottle itself is beautiful!